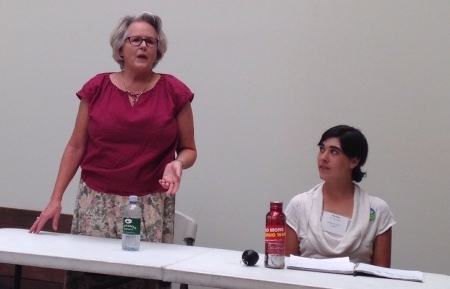 Candidate Julianne McCabe (left) at a recent candidate forum. Julianne McCabe’s curiosity led her to take up an independent study of transit issues in Boulder. The former attorney pored over RTD budgets, statewide transportation reports and local feasibility studies. She came to the conclusion that Boulder residents can’t just bike and walk themselves into the 21st century while padding RTD’s coffers along the way. Now, she wants to translate her research into action. McCabe, who was briefly a driver for the rideshare company Uber, says the city should abandon the idea of a community-wide EcoPass, which will just continue pumping money into RTD’s budget while not broadly addressing transportation needs. Instead, she suggests, Boulder should invest in its own local service routes and purchase RTD’s farebox for urban local services. The city should also rely on modern technology, such as GPS systems, crowdsourcing and interactive web sites to allow citizens to share rides. McCabe, who resides in the 500 block of Arapahoe with her husband Richard, has lived in the same home since 1976. She raised her daughter and three sons in Boulder and says she appreciates how walkable her neighborhood is, with easy access to downtown, Boulder Creek and the University of Colorado. She is currently substitute teaching in the Boulder Valley School District in bilingual schools and has worked with children with disabilities. McCabe, who moved to Boulder in 1970, earned undergraduate degrees from CU in history and geology. In 1976, she earned a law degree from the University of Denver. Professionally, she practiced law for 20 years before changing careers and working in real estate development. She started off remodeling a duplex in northwest Denver. Her next project was a spec home in Boulder and then a new, five-unit project in Golden. McCabe says that she could be a balanced voice on the board and she could bring a fresh perspective given that she is new to politics. Boulder resident Kevin Knapp will be voting for McCabe. He lives next door to the council candidate and has several backyard conversations with McCabe, which oftentimes center on concerns about transit issues, Boulder’s growth and congestion on the city’s roads. Another perk of living next door? “Julie has an amazing backyard garden and she’s super-generous,” says Knapp. He oftentimes comes home to find a bag of homegrown tomatoes on his doorstep. McCabe, in her spare time, enjoys gardening and hiking.